WinSnare virus can be very annoying and can keep installing on your Windows 10 or other operating system without your approval. That's because it has been spreading in a bundle with a bunch of components, including winsnare.dll. Each of these components has to be removed at once if you want to get rid of this potentially unwanted program for good. Otherwise, it can reappear right after rebooting the system. Mostly, Win Snare operates as an adware: after installing automatically, it starts causing commercial ads on all web browsers that can be seen during your searches. However, this PUP can also track information on the target computer and send logs to a remote server. Taking into account this feature, WinSnare can be considered a hacking tool as well. You can spot this virus by the .dll command in the Task Manager or C:\Windows\System32\svchost.exe -k process running in the background. If you found any of these, make sure you remove WinSnare because data-tracking activities should not be tolerated or ignored if you value your data confidentiality. The access to your personal computer can help the offenders to steal your private information. The title of this PUP may remind you of Snare (System Intrusion Analysis and Reporting Environment) – the collection of software which focuses on the decentralization of data log files. The latter program was devised by InterSect Alliance International Pty Ltd. However, WinSnare has nothing in common with the mentioned PUP. In reality, the app is closely related to amuleC virus, another potentially unwanted program which is based on the well-known legitimate program eMule. Besides, there have been claims that it is related to startpageing123 virus and can be installed with its help. Travels together with free software as optional component, attaches itself to torrent files and other downloads. Changes the start page on the browser, causes pop-up ads and fake alerts, slows down the browser. WinSnare virus may disguise under the name of a legitimate Windows system process in the Task Manager. We do not recommend choosing manual removal option if you are not an experienced PC user. This task can not only be troublesome for you, but can also end up with more troubles on your computer. Besides, this potentially unwanted program (PUP) spreads together with other potentially unwanted programs, so you need to know each name to uninstall it fully. If your antivirus detects this PUP, most likely, it will detect all potentially unwanted programs, like adware and browser hijackers, that could be related to this virus. To save your time, we suggest choosing WinSnare removal tool to run a full system scan and remove all components that are essential for this adware to function. We recommend using Reimage or Plumbytes Anti-MalwareMalwarebytes Malwarebytes. 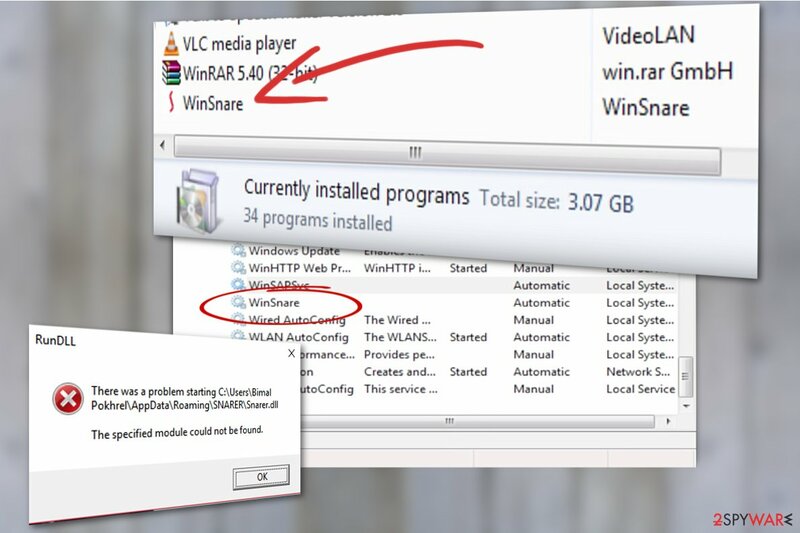 WinSnare is spread just like any other unwanted software – it can hijack your computer when you rush through some program’s installation steps without unchecking conditions that grant this PUP with the access to the system. Therefore, we suggest you act more attentively when installing random programs from the Internet. There is a simple misconception about the right installation settings – the most of the computer users believe that Default, Standard or Recommended settings are the most trustworthy ones. However, this is entirely incorrect and you should opt only for Custom or Advanced installation option. Otherwise, you can fall for installing bundled components. 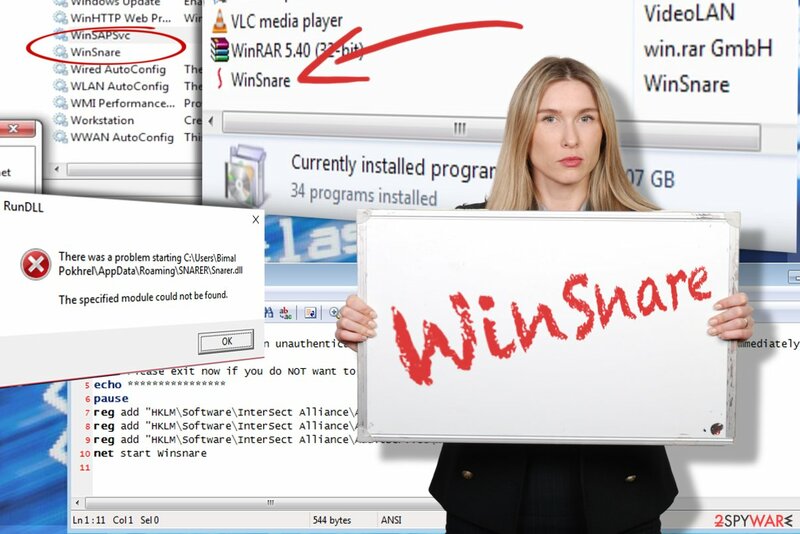 Software bundling allows the developers of potentially unwanted programs (such as Win Snare) to group their products with legitimate software and spread them together. In most cases, it turns out that these apps are ad-supported and that they cause only unpleasant activities on the target system. Agreements to install them are usually hidden under the Default or Standard installation settings, so the next time you install something from the Internet, make sure you choose Custom or Advanced installation option. Of course, you should also remove ticks under the suggestions to install unknown third-party software. Also, we must mention that there is a risk to infect the system with similar programs when installing pirated software. As we have already mentioned, there are two ways that you can use to remove WinSnare virus from your computer. Firstly, you can run a full system scan with your anti-virus or anti-spyware and get rid of every entry that is marked as unsafe or malicious. However, sometimes one antivirus programs fail to detect threats like this adware after the scan. In this case, it is advisable to update the software to its full version or use an alternative anti-malware. You should also check your Program Files and Program Data Folders for suspicious files that could be related to WinSnare virus. Make sure that you inspect both of your drives, C: and D:. Finally, if you can still notice ads on your web browser, you should go to “Appdata” folder and delete your profile for this web browser. To remove WinSnare from Windows, make sure you use these basic instructions. Do not forget to scan the system afterward to check if there are any suspicious files or applications that you missed. Here, look for WinSnare or any other recently installed suspicious programs. When in the new window, check Delete personal settings and select Reset again to complete WinSnare removal. Once these steps are finished, WinSnare should be removed from your Microsoft Edge browser. Here, select WinSnare and other questionable plugins. Click Remove to delete these entries. Now you will see Reset Firefox to its default state message with Reset Firefox button. Click this button for several times and complete WinSnare removal. Here, select WinSnare and other malicious plugins and select trash icon to delete these entries. Click Reset to confirm this action and complete WinSnare removal. ^ Patrick Allan. What to Do When Someone Gets Unauthorized Access to Your Computer. Lifehacker. Tips and downloads for getting things done. ^ 101 Ways Your Identity Can Be Stolen and Exploited. Acuant. Data Capture, Document Authentication . ^ What is Snare (software)?. Wikipedia. The free encryclopedia. ^ Olivia Morelli. Information about adware and removal instructions. NoVirus. 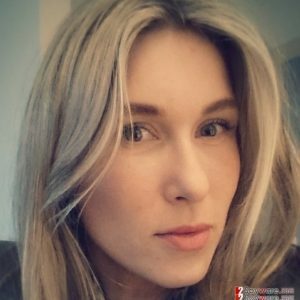 UK website about the latest cyber security news. This entry was posted on 2019-04-01 at 00:36 and is filed under Adware, Viruses. How did you remove WinSnare virus?